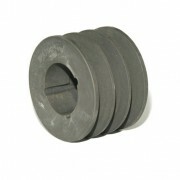 We carry in stock a large range of Cast Iron V-Pulleys to suit British standard taper lock bushes. SPA, SPB, SPC & SPZ profiles are all available off the shelf. Industry standard Vee Pulleys are available in cast iron, taper bored. Vee Pulley Stock Range Includes. Vee Belt Stock Range Includes.